My plan is to make a quilt for each of my boys. By the time I finish this, then I should be good enough to make a decent looking one for myself. Isn’t that why we have kids… to practise on them? I have very deep blue bedroom walls, and it has been impossible to find a doona cover that looks good, so I have to make one myself. I have never sewn. I borrowed a sewing machine from my friend Sandy, learned how to drive it and the next day went to my first quilting class. This was in December 2007. Edited to add: apologies that some of these are links to photos and some have to be replaced. Still, at least you can get an idea. The more recent ones are all here on the page. Flikr is doing weird things to my older photos. Quilt number 1. January 2008. For Evan4. It’s from a free pattern called ‘Breeze’ from Amitee , the quilting shop near me. I needed something simple (notice all the squares) and the colours had to be very testosterone-friendly, as I wasn’t sure how the boys would react to me making quilts for them. The backing is a flannelette sheet, the binding is homemade from black cotton drill and the top is made from lots of scraps that I bought as a bundle from the shop. It has turned out remarkably well and is a huge hit with the recipient. Evan. I started with the youngest and least critical child first. It’s the middle of summer and he’s been walking around for days wrapped up in it. Success! Quilt number 2: For Ryan3. Quilt number 3: David2’s quilt. This fiery thing was made over the course of about 6 weeks. I joined in with Amanda-Jean’s first quilt-a-long. David is into fire (not in a pyromaniac way) and dragons, so I chose vivid colours to fit into the decor of his room. I learned so much doing this quilt-a-long. The step by step instructions (with photos) made it invaluable. (It was like ‘Quilting For Dummies”… incidentally I also use that book!) I am reasonably happy with how it turned out (though I think the yellow patch was a mistake, and the black shows pet hair far too much; but hey… you live and learn), but I’ve found that I prefer the look of more co-ordinated quilt tops. The ‘sampler’ look isn’t really my thing. But David loves it, so that’s all that matters. Quilt number 4: Tom1’s quilt. All it is is patches of 3 strips sewn together (I used 4″x11″ strips from memory) and then put together with each patch facing a different way. I quilted in straight lines along each seam, so it looks as if each strip is 3 small patches sewn together. This may sound a little odd, but I’m working on another quilt that is exactly the same design, so when I complete it in a few days I’ll take a photo that’ll show what I mean. The backing was a flannelette sheet, with the ‘guitar’ fabric used as the binding. Tom chose the fabric for this quilt, and each of the 3 choices means something special in his life. (Sport: golf balls; guitars: he’s learning guitar and musical notes: he’s learning singing.) Of course, he said that he wanted to choose the fabric only after I’d assembled most of the quilt I was originally going to make. So Evan (who absolutely loved the colours) is getting a surprise for his birthday. Quilt number 5: Evan4’s Birthday Quilt. Exactly the same design as Tom’s quilt, but with by far more vivid colours. I went and bought some ready-made binding in Evan’s Football team colours, which added a little personal touch. I made this in secret, even sewing the binding in front of various classes writing assessment task essays in class, much to their bemusement. But I think it’s a good thing for students to see that people can be creative in a hand-on way, instead of just thinking that writing is the only creativity that teachers value. Evan loved it. He was so shocked that I was able to make something so time consuming without him knowing. I’m writing this two months after his birthday, and nearly every day he’s watched tv or played the Wii wrapped up in it, and at night it’s on his bed. I couldn’t be happier with his reaction. Quilt number 6: THE INTERNET QUILT. So called because everything from the conception, the materials, the design and the mitred corners came from the internet. This baby was the brainchild of Laura, who read about my trials and tribulations in July this year when the child support laws changed and my ex husband took full advantage of it, and she offered to send me some fabric to make myself a quilt. With such a lovely offer how could I refuse? I saw this design on Andrea’s blog, and after emailing her for permission and measurements I gave it a go. I adapted the design slightly to make the squares and rectangles bigger and I dispensed with the border that Andrea had put on hers, as I only wanted a lap quilt size to watch tv under. I sewed it using thread that I’d bought when I was with my sister, who hates blogging with a passion and thinks it’s a stupid thing to do. The blogging connections with this quilt just kept on happening!! I finished quilting it just in time to go with Widget to a blogmeet at the airport to meet Laura in person. Now that was a very special moment, watching Laura see what her fabric stash had turned into! EDITED TO ADD: I never thought I’d make a quilt and give it away, but the Internet Quilt now lives with my friend Judy, who was burnt out in the Black Saturday bushfires in 2009. I also ran a book drive for her sone Jarryd to replace the books he lost, and we raised well over 100 books that people from all over the world sent him. It was amazing. People truly are wonderful. Quilt number 7: Widget’s Quilt. 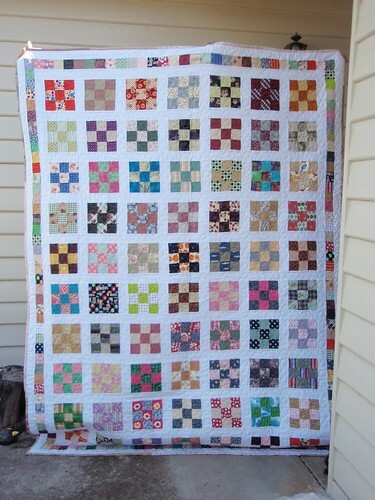 This was a quilt I made with and for my friend Widget. She was teaching Tom to sing and we agreed to do a barter thing, where he’d get voice lessons and I’d make her a queen sized quilt. I was hoping that she’d be ok with a doll quilt, but sadly she sleeps in a much bigger bed. We chose the patterned blocks from a book and I learned the joys of adapting a pattern and having to be flexible when things didn’t quite go to plan. 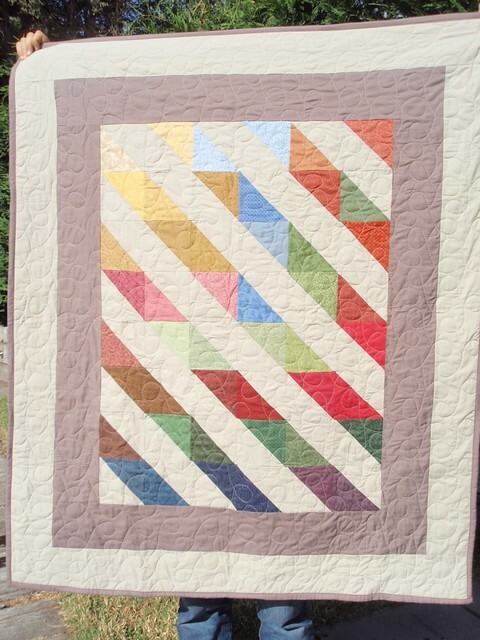 Even though this quilt top doesn’t look at all improvised, it certainly has elements in it! The borders around the patterned blocks were not part of the original design, but sometimes things happen for a reason. 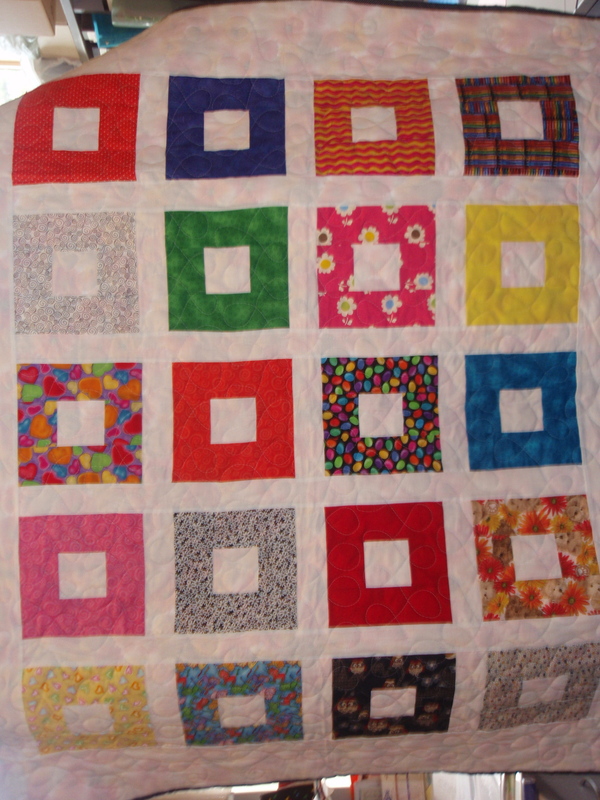 I think that without those blue borders, the whole quilt would lack pizzazz. Widget pieced the back herself, with fabric sent over to her from Laura of the Internet Quilt fame. (see above.) This was Widget’s first, (and apparently her last) attempt at patchworking. 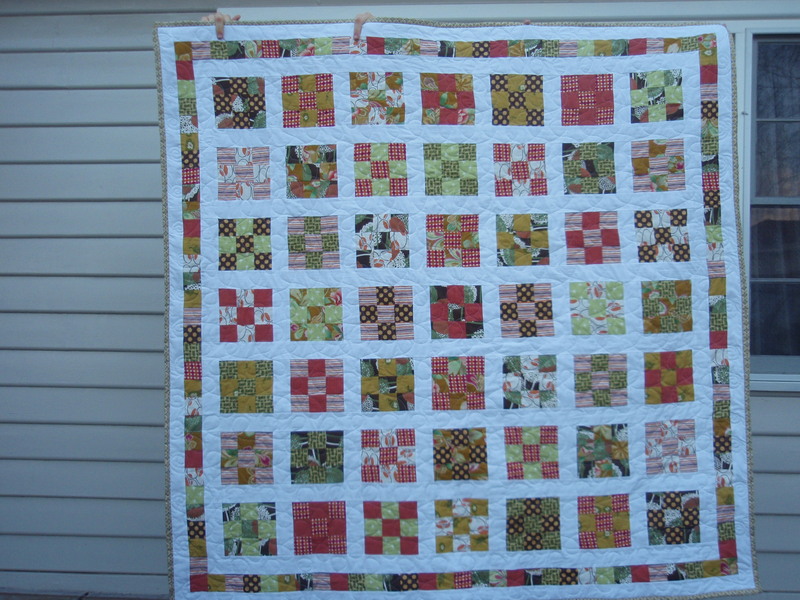 It’s lightly quilted in straight lines around the blocks and the binding is the same fabric as the background on the patterned blocks. My biggest quilt to date! Quilt number 8: The Basketweave strings quilt. 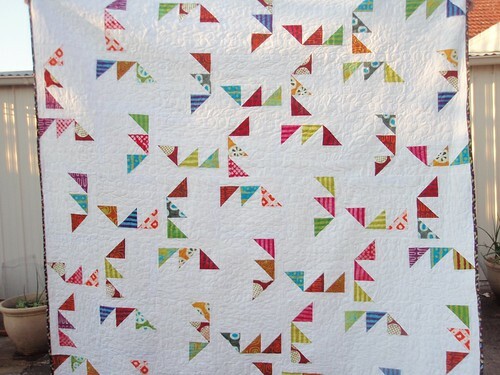 This quilt is all machine pieced… Queen sized…. 4″ squares… 3000 or so pieces… free form spirals throughout. An informal tutorial is here. Quilt number 9: The Circle Quilt. This one was made in a week (if you ignore the weeks that I had the pile of cut 12″ squares hanging around while I finished up the string quilt). Originally meant for me, but is now going to my 10 year old niece for Christmas. I saw the original quilt and tutorial here at Amy’s blog. 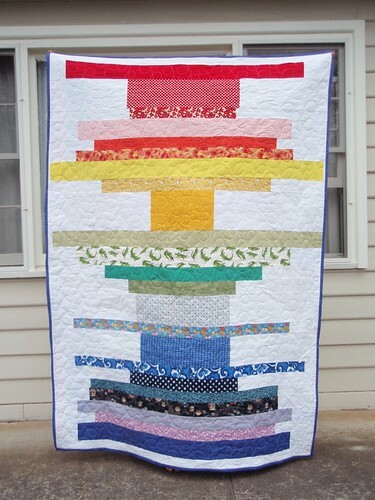 Quilt number 10: The Rainbow Quilt. This was a gift to my 10 year old niece for Christmas. 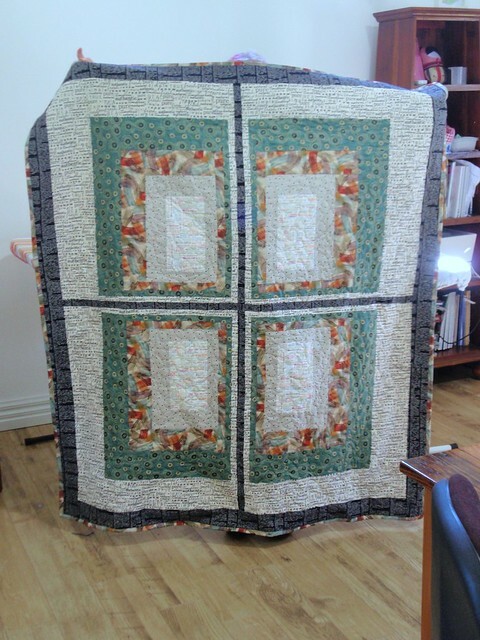 The top came together quickly, all from my stash, and for the first time I also pieced together two leftover strips of batting to make the quilt entirely from scraps. The back was a flannelette sheet I bought from Spotlight over a year ago to use just for this purpose. The white was all leftovers from the huge 9 patch quilt that I’ve yet to start quilting, (it’s basted together, ready to go), and the white only just made it… lots of little patches on the ends of the rows to get them to the right size. Very satisfying to use up all of the scraps. This was also the first time I quilted using an all-over swirly stitch rather than straight lines, and I LOVE IT! So much more forgiving and also much quicker. I really loved how this turned out and I’m pretty sure I’ll make similar ones like this in the future. It’s fun to pick things out of the stash and pop them together like this. 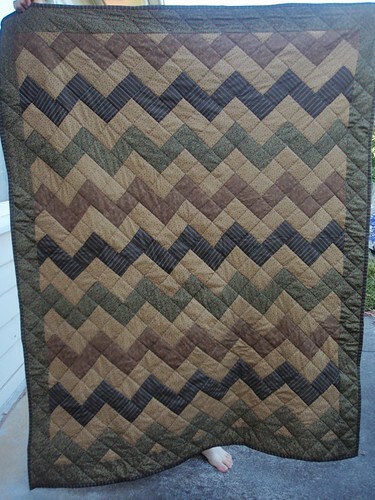 Quilt 11: Dan’s Zig zag Quilt. Yet another quilt I’ve made to give away! Dan is a very good mate of David2’s, so when I gave away the circle quilt to his female friend, I had to make something for Dan. It would have been rude not to, don’t you think? This one is so rich in autumnal tones…. it’s hard to give this one away because it looks so darned good on my couch! The photo doesn’t do it justice. 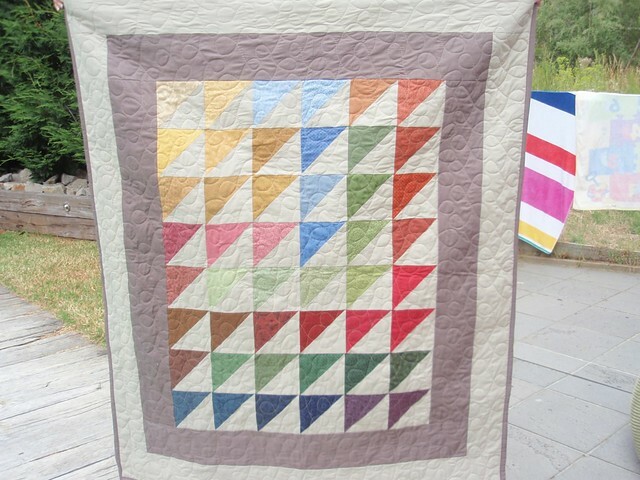 Blogged here, along with the online tutorial I used to make a zig zag quilt from squares rather than triangles. I made it to the pattern, but it looked not-quite-long=enough for a teenage boy, so I added 4″ borders around it to give it some added length and wrappability. I completed this quilt in 3 days. It was a lot of work in a very short time frame, but the result is worth it. I highly recommend this method of doing the zigzags. Quilt 12: The “Kitcheny” Quilt… otherwise known as the 9 patch quiltalong quilt. This quilt is huge. Tom1 and Ryan3 couldn’t hold it up high enough. 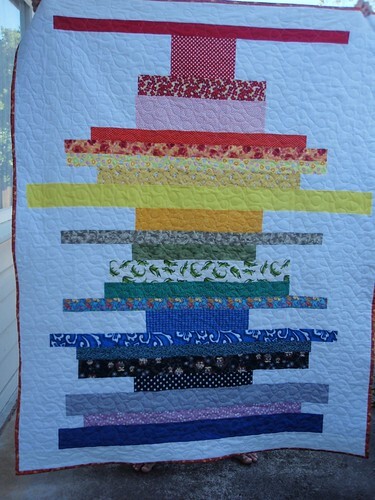 Quilt number 13: Another Rainbow Quilt. I had to make her a quilt… you’ve never seen a non-quilty person rave so much about a quilt as when I gave Dan his quilt. She kept saying how she kept trying to use it when they were watching tv and Dan would always ask for it, so clearly this woman needed a quilt of her own. I’ve also cut out rainbow strips for a quilt for me. I’m still loving the wonkiness! Blogged here, with an explanation of why the photo is full of movement, along with a link to the tutorial where I got the measurements for the blocks. Quilt number 15: Rainbow Quilt number 3. Pieced with rainbow fabric on the back from DottyCookie. This one’s special because I made it for US! No more nippy evenings watching tv! Quilt number 16: The ‘Gone Away’ Quilt. Blogged here, along with a link for the pattern. Made for my dear friend Scott, who now lives in chilly England. Blogged here, along with instructions of how I machine-sewed the binding. I am very happy with the finish and it saved quite a bit of time. Made for my niece for Christmas 2010. It looks a bit like a tickertape quilt but it isn’t…. no rough edges in this baby!! Everything is sewn down securely! Made from a mix of vintage sheets from England and fabric from here. Quilts 19 and 20: The sister quilts. Made for Christmas 2010 for my real sister and my best friend, who is like a sister. Identical in every way, except the HSTs are rotated differently in each quilt. TUTORIAL FOR MACHINE BINDING QUILTS. Quilt 21: The Charlie Brown Quilt. Made for my brother for Christmas 2010. Quilt 22: The Reading Quilt. I bought a whole heap of Moda prints from an Etsy shop and I liked the idea of using the print fabric as a quilt to read under. However, ‘free’ time becoming less and less available, I decided to take a leaf out of some American quilters I’ve seen and make a quilt using HUGE blocks. Worked a treat. This was a quick finish. 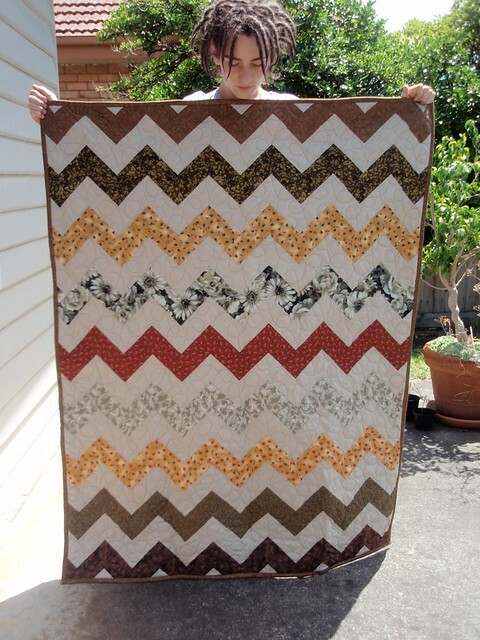 QUILT 23: The Inverloch Quilt. Completed 01/10/2011 and given to Mum and Dad. Made this for her when she lost her Mum. Congratulations! You are a “real” quilter now! Yea!!! Hey Frogdancer! 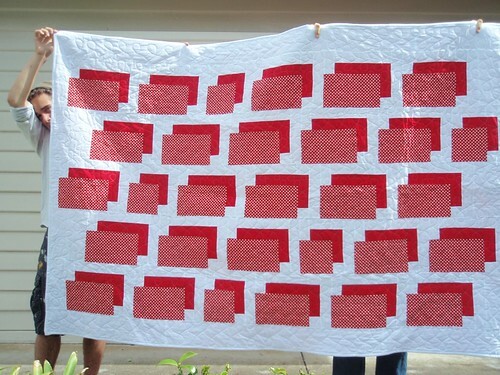 Come on over here…remember quilting? They look fantastic. So nice to see them all in one place. I love that you’re practising your skills on your kids first- bravo! I love to look at your quilts. Some of my most prized possessions are quilts made by my mammaw and great granny. I will keep these forever. I have made one quilt out of double knit (that tells you how long ago it was) and it so warm I can only use it on very cold nights. From someone who has always had trouble sewing a straight line, I have to say I am very impressed, both by the designs and the making – where do you find the time? I am a crocheter and make baby blankets, but I think the demand is lessening – just as well as they take months to make, and cost a lot too. They have to be very special babies! I just love all your quilts …where do you find the time …boy you are amazing …I also love quilting haven’t made any where near that amount . 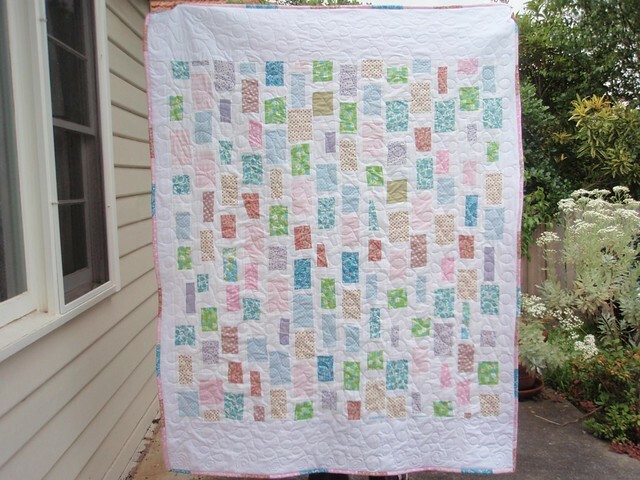 Hi Frogdancer, what beautiful quilts you have created! your boys are very lucky to have such a loving mother who also loves to share her craft. 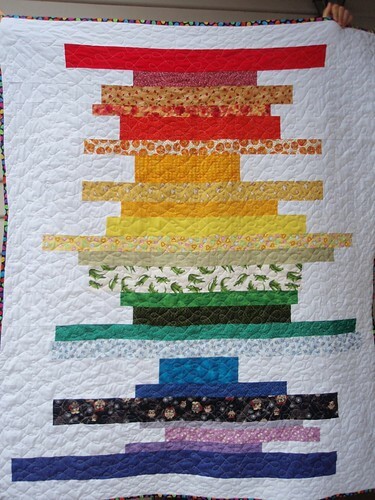 Especially love your “rainbow” quilts your design is fantastic! !